On New Year’s Eve, 1990, Vancouver hypnotherapist Philip Dozier, while treating shy, neurotic science student Greg Brodie, inadvertently leads his client to a traumatic memory—from twenty-five centuries ago. In doing so, he opens a Pandora’s jar of life-changing consequences. For it emerges not only that Greg may have been the Greek philosopher Pythagoras, and Philip himself a key figure in that remote time, but that Greg, in trance, can act as a channel—someone who gives voice to nonphysical entities. And an entity appears who has knowledge of a painful secret from Philip’s past. This spine-prickling revelation launches Philip on a search for the truth about himself, his connection with Greg, and the state of his soul. The search takes him on a journey through time and myth to the ancient rites of shamans and the primordial struggle between God and Goddess. But his current actions cause him growing alarm. For in his thirst to learn more, he finds himself lying, stealing, and plunging into not one but two extramarital affairs. Can Philip redeem himself—or even control himself? What will Greg do if he discovers that his supposed therapist has been using him? Maybe the great philosopher was right: we’re all doomed to repeat events from long ago, and we can’t escape no matter how hard we try. 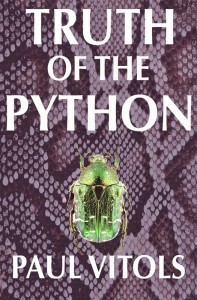 The idea that eventually became Truth of the Python was conceived in 1984 when I read Jacob Needleman’s book The Heart of Philosophy, in which he suggests that the ancient philosopher Pythagoras was the originator of our modern outlook. For Pythagoras sought to know truth apart from dogma, and thus could be termed the world’s first scientist; but he also understood truth to be something higher than mere concepts—an idea that fascinated and excited me. I wrote part of a draft, but left off as the problems it was raising seemed too much for me, and as other creative projects (notably in television) were beckoning. Then, in 1990, I visited a psychic, who told me I had an unfinished book manuscript sitting on a shelf in a closet, and that if I looked at it, I would find that I wanted to finish it. I didn’t remember where I’d put Truth of the Python, but when I came home, I looked in my office closet, and there, sure enough, on the shelf, rested a box containing the manuscript. When I read through it, I found my excitement rising again, and realized that I did indeed want to finish it. There were more bumps and detours along the way, but I believe that everything happens at the right time, and in 2011 I finally published Truth of the Python through Smashwords. Was it worth the long gestation? That’s not for me to say. It’s for you to say. From Scribd, along with hundreds of other books, magazines and audiobooks.